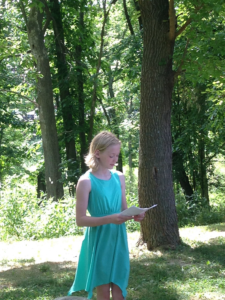 On Saturday morning, June 10th, a forest restoration project known as the Mary Kathryn Grove, was dedicated at Tower Park in Fort Thomas. 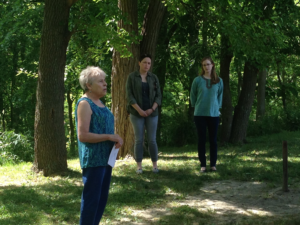 The project was undertaken to remember the late Mary Kathryn Dickerson, who served as the coordinator of the Boone, Kenton and Campbell Conservation Districts for more than 25 years. More than 20 larger trees were planted in the project area in a forest that had been devastated by the emerald ash borer. Signs about Ms. Dickerson legacy and about forest ecology were developed and installed as part of the project. 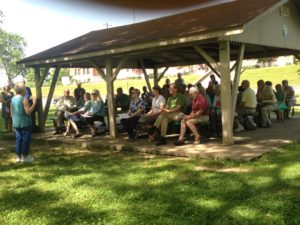 At least 45 people attended the dedication ceremony, which included readings about trees, as well as comments by District supervisors who had worked with Ms. Dickerson. As the program concluded, Ms. Dickerson’s husband, Bing, thanked everyone and remarked upon how much his wife would have appreciated the project because it reflected her values and love of nature. The Campbell County Conservation District provided major project funding through a forestry grant. The regional organization, Taking Root, also provided funds for the purchase of trees through a grant Taking Root received from Duke Energy. The City of Ft. Thomas generously provided the project site and will help maintain the trees. The actual planting occurred within an easement in Tower Park that is maintained by NKU’s Center for Environmental Restoration. Biologists Tara Sturgill, Jessica Spencer and Lorna Harrell comprised the project team. Many volunteers worked with them to make the project a reality. Thank you Lorna, Jessica and Tara for this excerpt and for the pictures. We appreciate all the work that you do for our area! We appreciate your support and comment!